What does Otiorhynchus sulcatus have in common with me? Well we both like heucheras, primulas, strawberries, begonias, impatiens and cyclamen. But while I like to grow the them and look at them, Otiorhynchus likes to eat them. I try to avoid this little monster as much as possible but I have never seem to escape it for long and this year it has made itself known to me by ruining my Saxifraga stolonifera plants. Having bought three plants last year I propagated it and had about 24 to plant out this autumn. All was going well until about a month ago when the plants looked a bit limp. I knew they were not dry so I knew my old friend had found me. I pulled the leaves off the soil surface and sure enough, there were no roots. Vine weevil had struck. Sure enough, just under the soil surface I found a little grub. I removed her to take a clearer photo. Despite the fact that this pest is such a destructive creature, it does have some fascinating aspects. Each adult can live for up to three years and can lay up to 500 eggs, on or just under the compost surface around suitable host plants. The outer wing cases of this dark grey beetle are fused so the adults cannot fly and there are no males; the females lay eggs parthenogenetically – without mating – more correctly termed thelytoky, in common with many aphids. The adults eat the edges of evergreen leaves such as camellias and rhododendrons, euonymus and bergenia and they chomp on these for about a month before they can lay eggs. The adults are about 15mm long with typical weevil, hooked ‘snouts’. After being laid, the eggs hatch in about two weeks and feed on the roots of host plants until winter when they tend to move deeper in the soil and continue feeding again in spring until about 10cm long when they are mature. They are ‘C’ shaped and cream with a brown head. They pupate and emerge as adults in summer. There is usually one generation an year. There are two effective ways to control them. 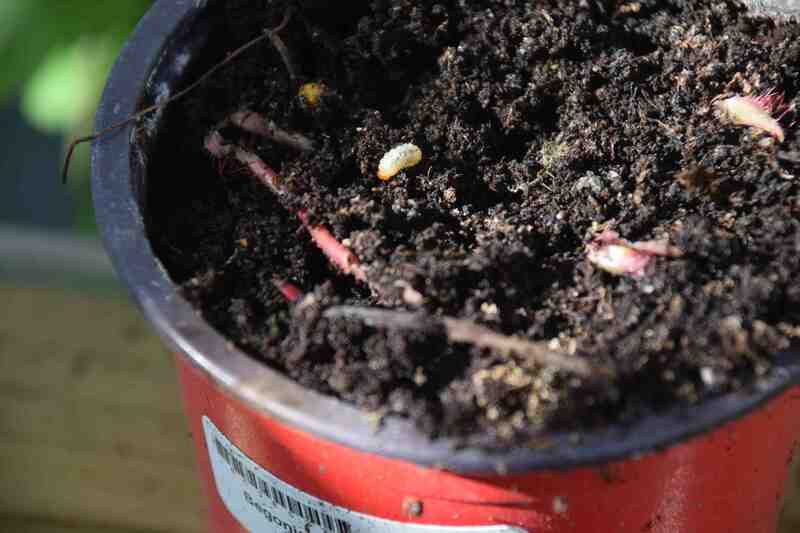 In containers, which is where they are usually more destructive because the plants cannot re-root in other parts of the soil, you can use an insecticide but because these are neonicotinoides you may prefer not to use them (I don’t use them any more). In the open garden and in containers you can use nematodes which are watered on the compost. I have found that if these are applied twice a year to susceptible plants they give good control. Sorry to hear that – that was just mean of them! thank you – and a more comprehensive review of the little blighters too! 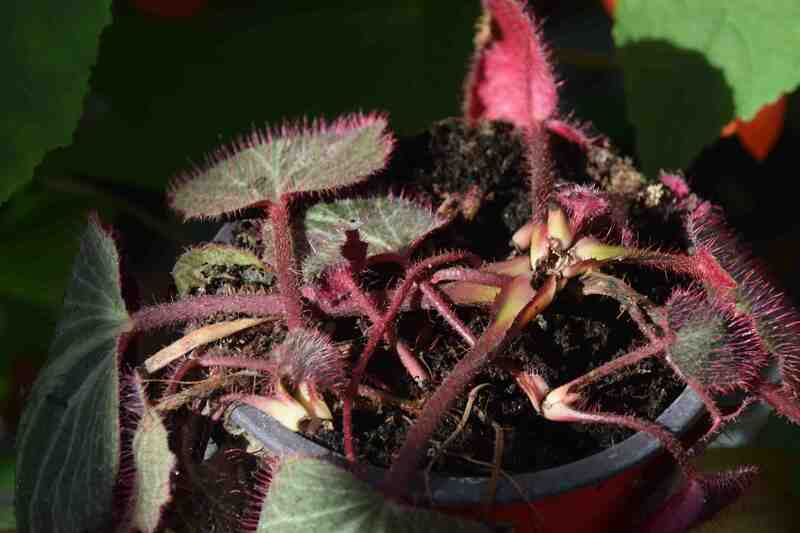 I also have a sad looking saxifrage … going to investigate now…. You never almost used a truer adjective! I had better check the plant you kindly gifted me. My garden abounds with the little blighters & I’ve lost countless plants. The flowers of my extensive plantings of London Pride are ruined by emerging young weevils nibbling on their stems just under the flower panicle causing them to break & be spoiled. I have all but given up on Heucheras. The deer eat them round the garden & the vine weevil demolish any in pots on the patio! Only today I bored friends ( not serious gardeners) on the evil vine weevil! Fortunately I didn’t get started on deer as they’re unlikely to encounter that B*****D in their suburban garden! i think the plant i gave you should be ok as it was soon after I potted it. The plantlets were clean but I bought in some succulents and that is where they came from I am sure!